EXCLUSIVE: Suspected asbestos that yesterday had been loosely fenced off beside the childcare centre at Curtin University was covered over with black plastic this afternoon after being reported to university security staff last night. 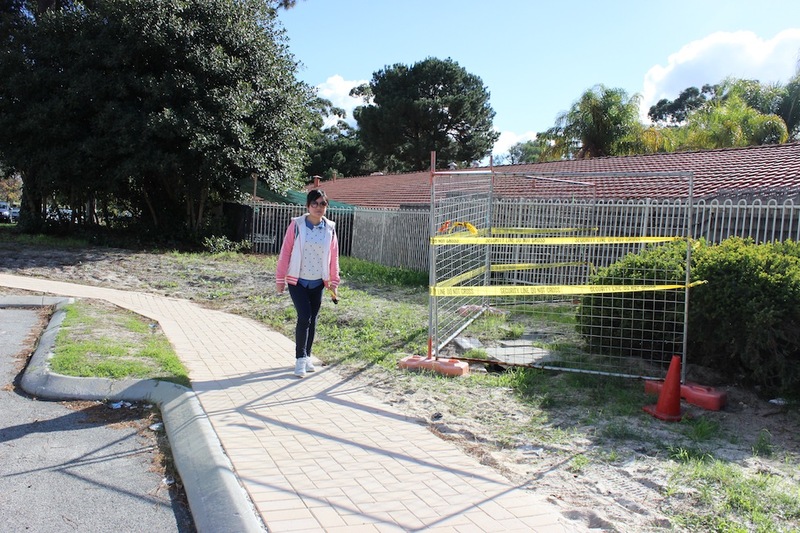 As Curtin students walked past this morning, pieces of material that looked like asbestos remained largely, but not entirely, contained behind temporary fencing at two locations abutting the southern fence of the Curtin Early Childhood Centre. The centre is closed for the WA Day long weekend, and it is not known how long the suspected asbestos has been exposed. However, the university’s Director of Health, Safety and Emergency Management, Nelly Gaasdalen, confirmed the material had come from damaged pits that house electrical cables. Upon receiving a report last night about the material, security staff placed yellow tape around the temporary fencing warning passers by not to enter. However, an InkWire inspection early this afternoon confirmed pieces of the material – some with fibres protruding – remained outside the line of the temporary fencing. InkWire also detected about 10 smaller pieces of the material around a newly-built cable pit about 50 metres to the west of the temporary fencing. The pieces found at the third location ranged from a small pine cone down to a 20 cent piece in size. These pieces have been reported to university health and safety staff. Affected area now covered in plastic. Inhaling asbestos fibres is the main cause of mesothelioma, a form of cancer that is 100 per cent fatal. The production and import of asbestos in and to Australia has been banned since 2004. Michael Rae, the chief executive officer of Melbourne-based asbestos awareness group Asbestoswise, said that while not devoid of risk, asbestos was relatively benign if in complete sheets. “The real hazard occurs only when the material is drilled or cut and if dust is created from it,” he said. Asbestos Diseases Society of Australia President Robert Vojakovic said there needed to be a more vigorous approach toward asbestos exposure in Australia. “People need to be aware of the risks associated with asbestos and need to take appropriate precautions when dealing with it,” he said. 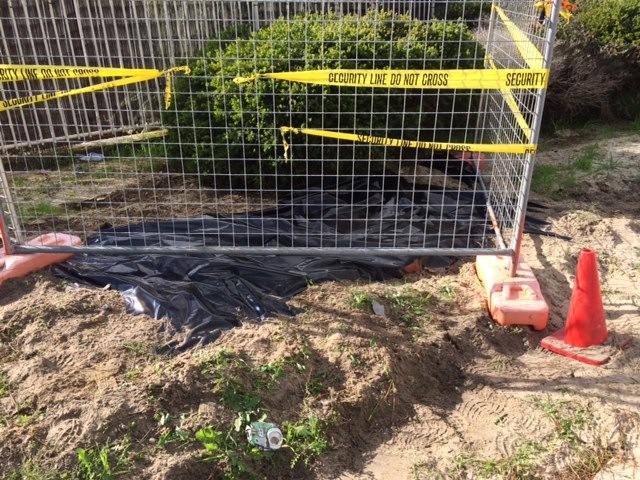 About 1.50pm today, InkWire observed two workers from Curtin’s property team dig around the material with a spade, then cover it in black plastic. Neither of the two men was wearing a protective face mask. One of the men, who did not want his name published, said he was not concerned about working in an area with suspected asbestos without a face mask. He said one of the two fenced-off areas was suspected to contain asbestos, and one was not. Curtin University student Ling Zhong who passed the site early this afternoon was not aware of asbestos and its health hazards. Ling Zhong walking past the area. Another student, Boyd Houff, said he did not really care about walking past suspected asbestos. Ms Gaasdalen said the presence of asbestos could not be confirmed until samples were analysed by a specialist external agency. “This process takes 24 hours as a minimum but may be delayed as a result of [today’s] public holiday,” she said. She said the black plastic would remain on site until it could be removed by a licensed contractor which would be arranged “as soon as possible and preferably by close of business Tuesday depending on availability of [the] contractor”. Curtin Early Childhood Centre could not be reached for comment.